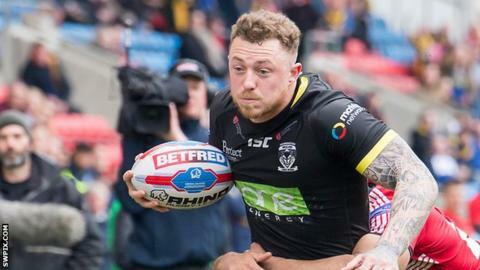 Super League sides Widnes Vikings and Warrington Wolves made routine passages through to the Challenge Cup sixth round against League One opposition. Danny Craven touched down four times to add to hat-tricks for Rhys Hanbury and Patrick Ah Van in Widnes' 17-try, 90-0 win at home to Coventry Bears. Warrington made light work of six-times Challenge Cup winners Bradford, winning their tie 54-6 at the Halliwell Jones. Josh Charnley also scored four, while Bryson Goodwin crossed for a hat-trick. In reaching the fifth round Coventry not only surpassed their previous best run in the Challenge Cup but also faced Super League opposition in a competitive fixture for the first time. Widnes have had a few injury concerns in recent weeks but they named a strong squad for this tie and were far too powerful, racking up 54 points in the first period and continuing that dominance after the break. Meanwhile, Bradford, under Challenge Cup guru John Kear, who has two of the competition's greatest final shocks on his CV after lifting the trophy with Sheffield Eagles and Hull FC, have lost just once in League One this season. However, Warrington came into this game with six wins in a row in the Super League under Steve Price, and their experienced side showed their class. Joe Keyes managed to get one try on the board for the Bulls as reward for their endeavour in front of 4,710 fans. The Challenge Cup draw for the sixth round and the introduction of the eight remaining Super League clubs will take place at 08:10 BST onwards on The Chris Evans Breakfast Show, BBC Radio 2 on Wednesday, 25 April.